Glenbrier Publishing Company published this book in 1989 in conjunction with the author. 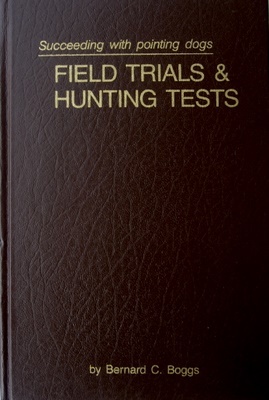 It has all the information a new owner of a pointing dog needs to train, hunt, compete and Judge in field trials and hunt tests, as well as information on how to operate an AKC field trial or hunt test. Dog owners, both professional and amateur, have praised Succeeding with pointing dogs—FIELD TRIALS & HUNTING TESTS as being the most useful and informative on the market. We no longer have this book available, although you may be able to order it online through Dogs Unlimited or by resellers on eBay.